The end of September and all through October are the best times to see the changing of the leaves. In Gatineau Park, there are tons of trails to explore and there are also quite a few special events occurring during its annual "Fall Rhapsody" celebration, which honours all things outdoors. My favorite place in the Gatineau region to get an absolutely awesome view of the leaves and the whole Ottawa Valley is, of course, the Champlain Lookout. There are more than 90 kilometres of trails and bike paths in Gatineau Park! If you really want to learn more about the coloured leaves as you hike, you can head up on Saturdays and Sundays in September and October for “Follies of the Fall Forest”, a free guided tour. It is fun for the whole family with an introduction at the Gatineau Park Visitor Centre followed by a guided walk on the Sugarbush Trail. For those adventurous hikers, the Eardley Escarpment rises 270 metres from the floor of the Ottawa Valley and extends over more than 30 kilometres. Also, Lusk Cave, in the Philippe Lake area, is an easy hike along but the 10-kilometre round trip takes about four hours to walk. For those with little ones who want a really nice nature trail to walk, there are lots of places around Ottawa like the Stony Swamp trails near Bell’s Corners, Green’s Creek, to the east of Ottawa and Pine Grove, to the south of Ottawa. No matter where you go in the Ottawa-Gatineau area this time of year, you’re pretty much guaranteed a great view of the leaves. By next weekend, Fall Rhapsody will be in full swing so don’t forget to get out there and enjoy one of the things that makes living in the Ottawa area so great! 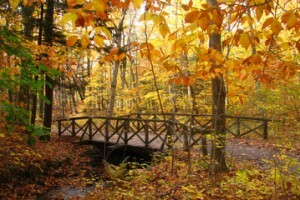 Where's your favourite place to see the leaves in Ottawa?